Most are located in the Middle East, especially Saudi Arabia. Ministry of Foreign Employment and Sri Lanka Bureau of Foreign Employment (Slbfe) offering training courses to send skilled workers abroad. Compared to last year, migrant workers down by 40%. Colombo (AsiaNews) - The Sri Lankan Bureau of Foreign Employment (Slbfe) has decided to terminate contracts with more than 600 employment agencies abroad (most of them in Saudi Arabia), to protect the rights of Sri Lankan migrants. The decision comes after incidents of abuse and discrimination against migrant workers, about 1.8 million people, 45% of whom are women. In addition, Dilan Perera, Minister for Foreign Employment, said it would organize training courses, to make the most qualified Sri Lankans seeking employment abroad. 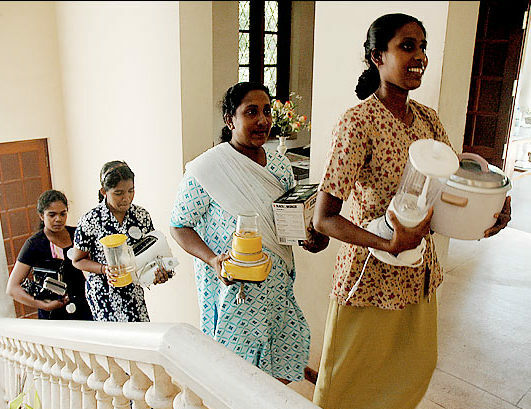 The majority of workers who leave Sri Lanka in search of work, is employed as domestic workers, often victims of prejudice, abuse and torture. To avoid such a situation, for some time the Slbfe has initiated support programs and preparation for these women, already obtaining some results: last year, the number of women seeking work in the Middle East fell by 40%. Moreover, according to data compiled by the office, the number of skilled migrant workers has increased by 50%. Contacted by AsiaNews about the reduction in the number of migrant women, some say they "appreciate" this new trend, because the country "should show the world that here we are educating capable and competent women." Already in 2011, the Slbfe had suspended contracts with 445 agencies, 166 of which in Saudi Arabia. In Sri Lanka, the debate about migrant workers - especially women - was inflamed when in June 2007 Rizana Nafeek was sentenced to death in Saudi Arabia for the alleged murder of a newborn child of the family she had gone to work for as maid at the age of 17.